Yesterday pop icon Rihanna tweeted her loyal 26 million followers the first look of her cover from the November 2012 issue of Vogue Magazine. On the cover, a fiery, red hot Rihanna appears with short black hair and a bright red lip. RiRi is styled in a beautiful red lace dress, posing in a field of weeds. 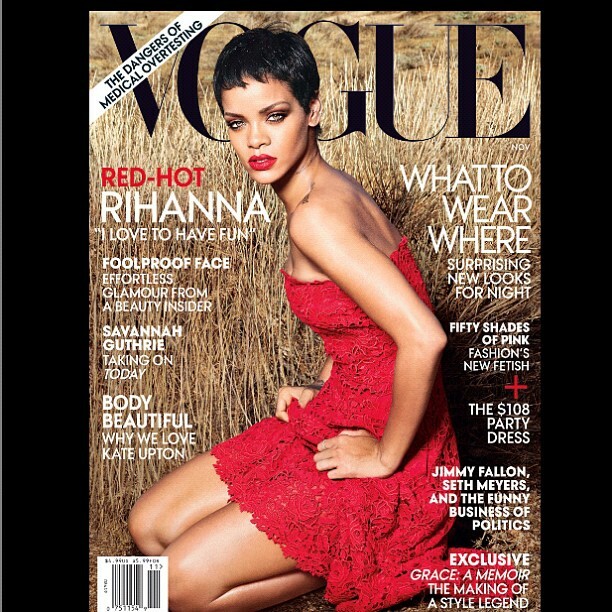 Rihanna is one of few black women to appear on the cover of Vogue Magazine. She joins supermodels and black beauties like Naomi Campbell, Halle Berry, Beyonce and even Oprah! In other Rihanna news, she is busy finishing up work on her latest album “Unapologetic” right now-- out in stores on November 19th. And as soon as she wraps that up and the album is released, she plans to go public with her reconciliation with Chris Brown, according to an article published in the The Hollywood Life yesterday.